Through our own suffering we are reminded of our mortality and human limitations. Our pain reminds us we are not omnipotent nor unbreakable! 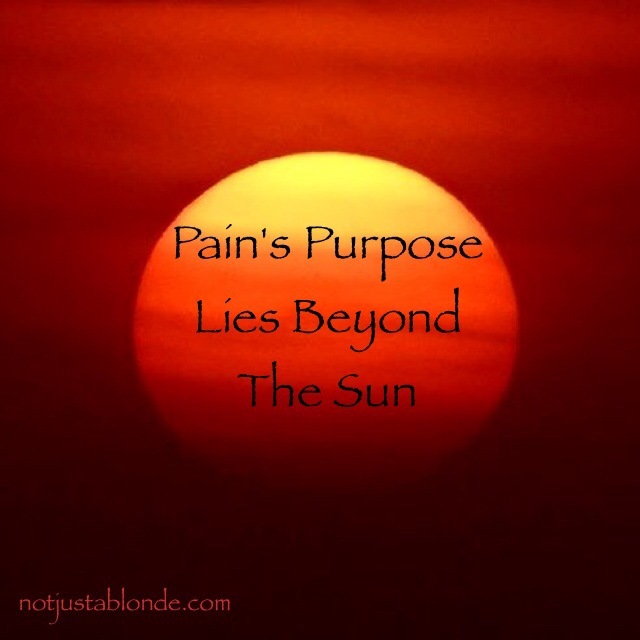 Pain propels us to look beyond our current circumstances. Pain is a humbling force in our lives. It forces us to look outside of ourselves for hope and for direction. No longer satisfied with propelling by our own efforts alone, we are encouraged to seek out comfort and help to carry us through. We can be consumed by pain or we can try and overcome it. By choosing to focus beyond our pain we are choosing life over death. Our hope lies beyond our pain. We create links with others when we reach outward for healing and for help. The connections we create with others is the conduit to a power greater than ourselves. This power is the power of miracles and of healing! This power not only connects us to each other but to God. Pain can be a catalyst for spiritual connection with each other and with the Divine. Pain encourages us to focus outside our physical selves onto the eternal. This is pain’s ultimate gift: the gift of connection and the awareness of something greater outside ourselves and beyond this world. Pain’s ultimate gift is Divine. Pain causes some of us to develop empathy for others in pain. However, some people seem to respond to pain by passing it along to other, as though they are getting even with the human race. One is beneficial, the other is terrible. Yes. Pain offers us a choice. One choice leads to life and light and the other to suffering and death. The choice, of course, is ours. Pain absolutely can destroy us if we let it. With the fuel of our pain we can perpetuate it’s destruction. Each of us know folks who have let pain destroy their lives and injure the lives of those they love or who randomly cross their path. This is so tragic. It does not have to be so. It is my hope that I always remember this myself. Pain is an invitation for us to ask for help from our Earthy family as well as from those beyond the veil, including God Himself. Unless we look outside for help and look beyond our pain, it can and will destroy us. There are also those who survive unbelievable circumstances and suffering. Without exception these folks open up their lives to others for healing and hope. They are seekers seeking solutions, remedies and healing. Actively looking outward from their pain they can see the miracles that appear in their path and can embrace them! From addicts in 12-step groups to grieving mothers as part of support groups those in pain often find each other and together can pull each other through. Together with the power of love they live life more abundantly.